(AINA) -- 119 churches have been attacked or bombed since June, 2004: 45 in Baghdad, 64 in Mosul, 8 in Kirkuk and 1 in Ramadi. The following is a list of the bombings. Click here for pictures of bombed churches. Last updated on October 10, 2016. For a report on the persecution of Assyrians in Iraq, see Incipient Genocide: The Ethnic Cleansing of the Assyrians of Iraq. Click on the date for the news source. ISIS bombed the Fouq Attal Church in Karemlis, completely destroying it. ISIS completely destroyed the 1400 year-old Assyrian monastery. June 25, 2013: 1 church bombed. Gunmen opened fire on St. Mary Assyrian Church, wounding two security guards. September 16, 2012: 1 church bombed. A bomb placed at the door of the Cathedral of Kirkuk exploded at 20:45. No one was injured but the church was damaged heavily. March 20, 2012: 1 church attacked. The Syrian Orthodox Church of St. Matthew in Baghdad was bombed, killing two and wounding five. August 15, 2011: 1 church attacked. St. Ephraim Syriac Orthodox Church was bombed. No injuries were reported but the church suffered severe damage. August 2, 2011: 1 church attacked. A car bomb exploded outside a Catholic church in central Kirkuk, Iraq, early Tuesday, wounding at least 20 people. April 24, 2011: 2 churches attacked. On Easter Sunday a bomb exploded outside the Sacred Heart church in Baghdad. No parishioners were injured. A firefight occurred outside Mary the Virgin Catholic Church as congregants huddled inside. October 31, 2010: 1 church attacked. December 23, 2009: 2 churches bombed. In Mosul the church of St. George and the church of St. Thomas were bombed, killing three people. The church of St. Thomas is 1200 years old. December 15, 2009: 2 churches bombed. The Al Gahera (Our Lady of Purity) Syrian Orthodox Church in Mosul's city center was bombed and significantly damaged. 4 persons were killed and 40 injured. The Al Beshara (Annunciation) Syrian Catholic Church in Mosul was bombed at 10:30. The bomb caused a minor explosion and damaged the wall, but nobody was hurt. November 26, 2009: 1 church, 1 convent bombed. In the western Jadida (New Mosul) district, the Church of St Ephrem and the St Theresa Convent of Dominican Nuns were bombed and heavily damaged. No casualties were reported. July 12, 2009: 7 churches bombed. January 9, 2008: 2 churches bombed. Two churches were bombed in central and northern Kirkuk; three people were wounded. January 6, 2008: 7 churches bombed. Saint Paul Chaldean church in Zafaraniya area where, according to Mgr. Warduni, the carbomb was discovered before its explosion and defused. One man was slightly injured in these bombings. June 4, 2007. 2 churches attacked. St. Jacob Church, near the Asia Neighborhood (Hay Asya) in Dora, was attacked and the Christian guards killed, the church was looted and will be turned into a mosque. St. John the Baptist Church near the Hay Al-Athoriyeen (Assyrian quarter) was also looted. May 31, 2007. 1 convent attacked. Shiites occupied the Angel Raphael Convent, belonging to the Chaldean Sisters of the Scared Heart, in Dora, Baghdad and turned it into a base for military operations. May 18, 2007. 1 church attacked. St. George Assyrian Church in the Dora neighborhood of Baghdad was firebombed. April 14, 2007. 2 churches, 1 monastery attacked. An Islamic group forcefully removed the Cross from the churches of St. John and St. George in Dora, Baghdad. An affiliated Islamic group in Northern Iraq occupied the Assyrian monastery of Raban Hormuz. November 1, 2006. 1 church bombed. Unknown assailants bombed the entrance of the Dominican Clock Church compound, a Catholic church in Mosul. October 8, 2006. 1 church bombed. Two bombs exploded around 6:30 A.M. near the Church of Virgin Mary on Palestine road in Baghdad. The outer walls of the church were damaged and the windows of many parked cars that belong to the church were shattered. One policeman was killed and many bystanders were injured. October 4, 5 2006. 1 church attacked. A group of men opened fire on the Chaldean Church of the Holy Spirit in Mosul, the second time in 8 days. September 27, 2006. 1 church attacked. A rocket attack was launched against the Chaldean Catholic Church of the Holy Spirit in Mosul. September 24, 2006. 1 church bombed. St. Mary's Cathedral, the home of His Holiness Mar Addai II, Patriarch of The Ancient Church of the East, was bombed. Located in the Riyadh district of Baghdad the cathedral experienced dual bombings, a small IED followed, few minutes after, by a car detonation carrying a large amount of explosives. The bombing was timed to take place as the worshipers were leaving the Sunday morning sermon. 2 were killed and 20 injured. September 8, 2006. 1 church bombed. Two bombs exploded in front of the main gate of a church in al-Za'faraniyya in Baghdad. The explosions caused damage to the church and injured the church guards. June 2, 2006. 1 church bombed. Kaneesat al-Si'aood (The Church of Ascension) in Baghdad was attacked by a rocket bomb. The bomb caused damage to the church building and made a hole in the church dome. February 1 2006. 1 church bombed. The Baghdad Seventh-day Adventist Church was bombed for the second time in two years, injuring an armed guard, one of two permanently stationed to protect the church compound. January 29, 2006. 4 churches bombed. Car bombs exploded outside the Vatican embassy and near four churches in Iraq, killing at least three people. In Kirkuk, three civilians were killed and one wounded in the attack on the Church of the Virgin, and six civilians were hurt in the blast outside an Orthodox church. In Baghdad, car bombs exploded outside St Joseph's Catholic Church in the suburb of Sina'a and an Anglican church in the eastern Nidhal area. November 2, 2005. 1 church bombed. At approximately 5:00 P.M. a car bomb exploded near the Church of Mar Giwargis (St. George) in the Assyrian quarter of Almas district in Kirkuk. 3 were killed. July 16, 2005 1 church bombed. A small explosion rocked the Assyrian Church in Habbaniya, Ramadi in Iraq. There was some damage to the roof of the church. December 7, 2004. 2 churches bombed. The Al-Tahira Chaldean Catholic Church and Armenian church that was under construction were bombed in Mosul. The first blast struck the al-Tahira ("the pure," in reference to the Virgin Mary) Church about 2:30 p.m. in al-Shifa' neighborhood, eastern Mosul. Ten armed men stormed the church, planted explosives throughout it, and set the bombs off wounding three people and destroying most of it. An hour later, gunmen bombed in al-Wahda neighborhood, western Mosul, an Armenian church under construction. No casualties were reported there. November 8, 2004. 1 church bombed. St Bahnam's Catholic church in Dora, Baghdad was bombed, killing 3 people and wounded 40. 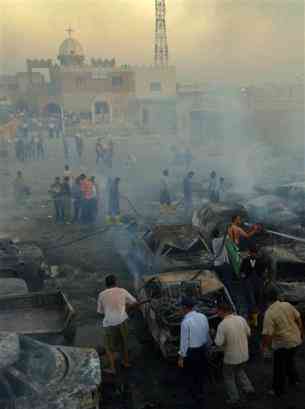 Police said a car bomb had exploded outside the church, but witnesses said it appeared explosives were planted nearby. October 16, 2004. 5 churches bombed. Five churches were bombed in Baghdad in a coordinated attack. The church of Saint Joseph in the west of the Iraqi capital was hit at about 4:00 am (0100 GMT). Twenty minutes later, another blast ripped through the streets at another Saint Joseph church, in Dora, southern Baghdad. After another 20 minutes, Saint Paul's church was struck in the same area. At 4:50 am, the Roman Catholic St. George church in the central district of Karrada was rocked by a blast and engulfed in flames, leaving the wood-built sanctuary completely charred. A fifth explosion occurred about an hour later at Saint Thomas church in Mansour, to the west. An artillery shell, believed to be intended for the church, was fired into a car park between a hotel and Saint George's Anglican Church. September 11, 2004. 1 church bombed. A car bomb exploded outside the Virgin Mary Seventh-Day Adventist Church in the Al-Sa'doun Park in the center of Baghdad. September 10, 2004. 1 church bombed. A bomb exploded at the Assyrian Anglican Church at al-Andalus Street in Baghdad. The explosion occurred during the night. August 1, 2004. 5 churches bombed. June 26, 2004. 1 church attacked. Two unidentified men in a silver Opel throw a hand bomb at the Holy Spirit Church (al-Rooh al-Qudos) in the Akha' quarter in Mosul. The explosion injured the sister of the priest.